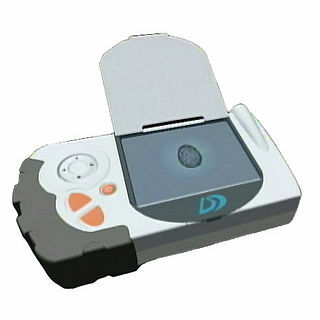 A D-Terminal (D-ターミナル D-Tāminaru) is a hand-held communications device. Send and receive messages from other D-Terminal units. Can additionally send messages to e-mail or specific computers. 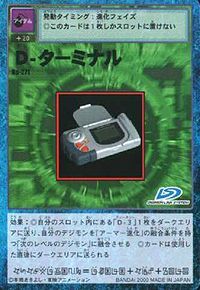 Can store multiple Digimentals and transfer them to a D-3 digivice to aide in evolution. D-Terminals were used as a means of communication and a place to store Digimentals by the Chosen Children. They work in conjunction with a D-3. Himekawa Maki is shown to possess a D-Terminal, likely Ichijouji Ken's, in Kokuhaku. This page was last modified on 2 December 2016, at 09:09.